“Longest Walk ends at National Mall,” Histories of the National Mall, accessed April 22, 2019, http://mallhistory.org/items/show/204. 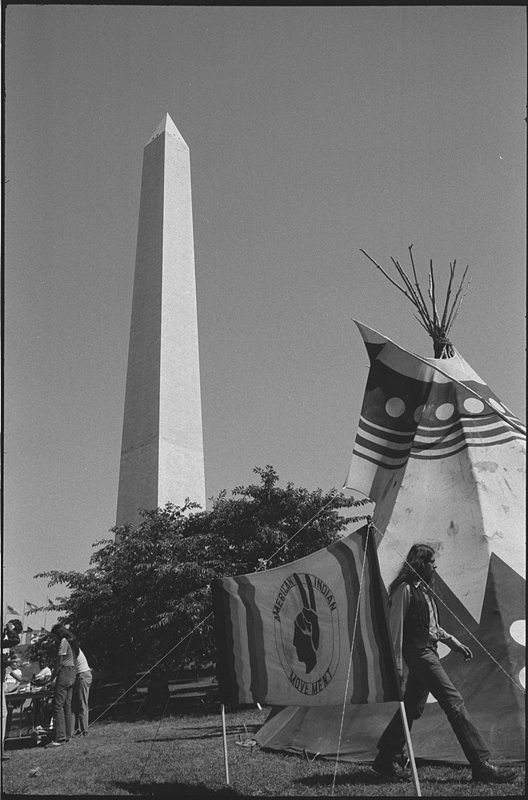 In February 1978 the American Indian Movement began The Longest Walk, a cross-country march beginning on Alcatraz Island in California, to support tribal rights and bring attention to 11 pieces of legislation before Congress affecting American Indians. The proposed legislation changed the provisions of early treaties on tribal government, hunting and fishing rights, and schools and hospitals. Marchers arrived in July. Tribal elders and walk leaders camped in tipis on Washington Monument grounds. Over the course of a week, they held rallies and meetings throughout Washington, including at the Capitol, Supreme Court, and White House. None of the bills they protested were passed.